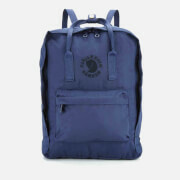 Navy cocoon-shaped backpack from premium sportswear brand, Y-3. Fastening with a side zip, the bag features inner and outer zipped pockets, an elastic cord handle and padded shoulder straps. Printed branding completes the design.